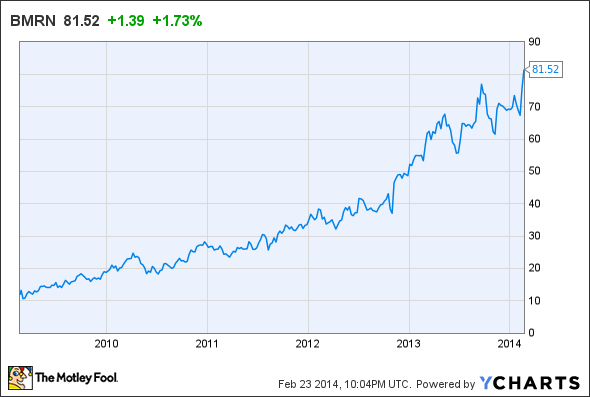 Orphan drugmakers have been soaring over the past two years, and BioMarin is no exception. After such large gains, however, investors should consider if BioMarin can continue to head higher over the long-term. Orphan drug specialist BioMarin Pharmaceutical (NASDAQ:BMRN)enjoyed a notable week. It started with the U.S. Food and Drug Administration, or FDA, officially approving the company's enzyme replacement therapy for Morquio A syndrome called Vimizm. And the European Medicines Agency's, or EMA, Committee for Medicinal Products for Human Use, or CHMP, closed out the week by recommending Vimizim for approval as well. According to statements made during BioMarin's recent conference call, Vimizim could see final approval in Europe by late April following this positive opinion from CHMP. All this good news helped BioMarin shares climb 7.36% for the week, reaching new all-time highs in the process. Viewed in this light, I think investors should consider whether BioMarin still has any remaining upside, or if it's time to take profits. Last Tuesday, BioMarin held a conference call outlining preliminary 2013 financial results and 2014 financial guidance. CEO Jean-Jacques Bienaime set the tone for the call by stating that Vimizim should drive BioMarin revenue to over $1 billion in the near future, and that the company's next orphan drug, BMN-701 for Pompe disease, could be approved within two years. Continuing this optimistic outlook, BioMarin's other officers noted that Vimizim received the broadest label possible and the commercialization efforts have already begun. Digging into the details, Vimizim is expected to cost $380,000 per patient per year on average, and first-year sales are projected to come in around $60 million to $70 million. Over the next two years, Vimizim is expected to propel BioMarin to profitability, as the drug becomes the company's largest revenue generator to date. BioMarin expects full-year revenue to grow to $650 million to $680 million, an 18% to 22% increase over 2013. Even so, clinical expenses are still projected to total around $530 million this year, and management gave guidance of a non-GAAP net loss of roughly $100 million in 2014. The good news is that 2014 should be BioMarin's peak year in terms of clinical expenses as a percentage of revenue. In fact, the company believes that profitability could be achieved within the 2015 to 2016 time frame, if all goes according to plan with Vimizim's commercial launch. To sum up, Vimizim's approval is perhaps the most important event to date at BioMarin, and the drug should grow revenue by double-digits every year for the next few years. BioMarin shares have now risen a healthy 53% in the past year based on the strength of its commercial and clinical pipelines. That said, you should keep in mind this orphan drugmaker is now trading at 17 times 2014 estimated revenue, and the company isn't expected to become profitable any time soon. To put these numbers into context, we need to take a look at how shares of other leading orphan drugmakers are trading. At the low end, Jazz Pharmaceuticals is trading at around 10 times revenue; shares of Alexion Pharmaceuticals are trading closer to 23 times revenue; and finally, Isis Pharmaceuticals leads the pack by trading at a stately 54 times revenue. BioMarin therefore isn't the most expensive orphan drugmaker out there, but investors have to wonder how much longer the market will continue to pay substantial premiums for earnings from biopharmas in general, and orphan drugmakers in particular. With that said, I have been suspicious of the market's pricing of orphan drugmakers for some time now -- yet all they've done is continue to head higher. Based on BioMarin's improving fundamentals and promising clinical pipeline, I would expect it to be a top performer within this group, assuming the sector-wide trend of paying top dollar for earnings holds.